These So-Cal rockers sure can put on a show. Last week, Bad Suns performed at (Le) Poisson Rouge, an intimate music venue in Greenwich Village that holds 700 people. When I arrived at the venue and saw a line wrapped around the corner, flowing all the way down the block, it was almost hard to believe that we were all here to see a band who is only on their second-ever headlining tour. Flashing back to three years ago when they opened for The 1975, I was one of two audience members in the pit that knew all the words to their singles, knew the members by name, and couldn’t wait for their debut album to drop. To see a turnout like this was amazing. The fans that lined the strips of sidewalk were people that I recognized from every single one of Bad Suns’ previous shows in NYC, as well as newcomers to their fandom since Disappear Here, the band’s sophomore album was released. A sign posted on the door of the venue read “BAD SUNS IS SOLD OUT”, so I immediately knew this was going to be a good one. Once inside, I began chatting with fans while waiting for the opening act to take the stage. “This is my first time seeing Bad Suns, but I’ve been listening to them for three years!” said an excited teenage girl. Following the girl’s statement, other concertgoers joined in on the conversation and said “I’ve been here since 8 a.m.!” and “There are already people camping out for their show in Pennsylvania tomorrow!” This made one fact abundantly clear—this was a community of fans who were devoted in the truest sense of the word. The audience was warmed up by alternative pop four-piece, COIN. The Nashville natives delivered a performance full of charisma and enthusiasm. The combination of upbeat vocals and energetic synths played by frontman, Chase Lawrence (synth/vocals), along with members Joe Memmel (guitar/vocals), Ryan Winnen (drums), Zachary Dyke (bass), had the (mostly female) crowd squealing with delight—even on the very first song they brought to the stage. Considering that the band recently gained mainstream attention with the release of their song “Run”, these guys felt like seasoned pros to the alternative music scene. After treating us to “Talk Too Much”, another soon-to-be hit from their forthcoming second album, as well as new songs “Boyfriend” and “I Don’t Wanna Dance”, the concertgoers were pumped up and ready for the main act. When it was time for Bad Suns to come on, there was a shift in energy; there was a buzz from the crowd, anticipation growing with each passing minute. As soon as Christo Bowman (lead vocals/guitar), Miles Morris (drums), Gavin Bennett (bass/keyboard), and Ray Libby (guitar), took to the stage and opened with, “Disappear Here”, they were instantly showered with applause from their psyched fans. When I last saw the band in February 2015, the Southern California natives played with a sense of urgency, but this time the vibes were different. 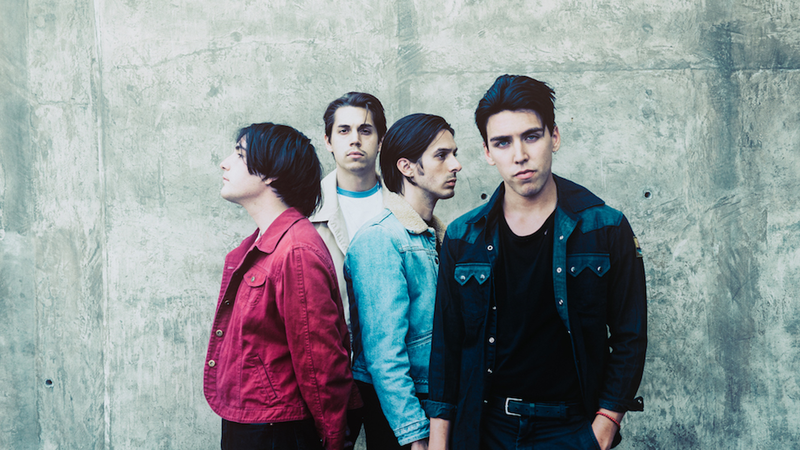 After a small hiatus to work on their sophomore album, Bad Suns returned to the live music scene exuding a new kind of confidence. Saw Bad Suns open for New Politics almost 2 years ago & have been dying to see them headline since. Tuesday night - mission accomplished. The setlist boasted 17 songs that spanned their EP, Transpose, their debut LP, Language & Perspective, and their sophomore album, Disappear Here (released this past September). Some crowd favorites included “Dancing on Quicksand”, “Daft Pretty Boys”, and “Violet”, which had the crowd grooving to the guitar-driven tracks. “Don’t you even think of going anywhere,” said Bowman, announcing an encore before leaving the stage. When they came back, the band closed out with “Rearview” which made the crowd lose control, “Heartbreaker” for anyone that’s ever been burned by a former lover, saving the powerful track “Salt” as the finale for the souls who have struggled with their own identity. When the final chords of the song played, it was clear—Bad Suns is in it for the long run. The “Cardiac Arrest” musicians will continue their tour with COIN as they make their way back to the West Coast, performing the five sold out dates of the tour before wrapping up in Los Angeles on November 18. The rest of the tour is officially sold out, but be sure to track Bad Suns on Bandsintown to find out when you’ll be able to score tickets to a show near you in the future!